Originally from Wallace, I graduated from North Carolina State University with a Bachelor of Science in Animal Science in 1991 and a Doctorate of Veterinary Medicine in 1995. After completing my studies, I accepted an internship with the large animal medicine and surgery facility at the University of Georgia. 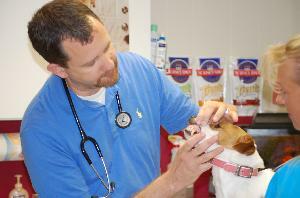 Since 1996, I have practiced veterinary medicine in Southeastern North Carolina. While a generalist, providing medical and surgical care to large and small animals, I hold special interest in equine reproduction and dentistry and small animal orthopedic surgery. When not at work I enjoy spending time with family, hunting, fishing, playing guitar and watching football.